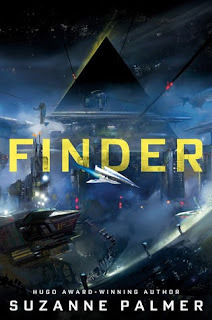 Finder is a science fiction novel by Suzanne Palmer. From Hugo Award-winning debut author Suzanne Palmer comes an action-packed sci-fi caper starring Fergus Ferguson, interstellar repo man and professional finder. Hmm. I'm sad I didn't connect to this one like other reviewers seem to have connected with it. Fergus Ferguson is a bit of an Indiana Jones type character, but he's having his action adventure in space. Fergus is a repo man, and he's on a mission to steal back a spaceship. I think my issue lies in how action heavy Finder turned out to be. I love action, but this book was pretty full throttle the whole way through. When I started Finder, I thought "Yes! This is going to be so much fun! ", but the level of fun kept going and the character-action scale tipped too far down on the action for me. If you love nonstop action, though, without getting to know who you are rooting for, this might be a really great pick for you. Hopefully it will be a fun read for you! I have to be in the right mood for this kind of book. I think I'm the same way. Dang, I was looking forward to giving this a read, but all action and nothing much else is kinda tough to like. I do like the sound of an Indiana Jones type protagonist though! You know how you don't really know if Indiana Jones is a lucky idiot or actually brilliant? LOL. Maybe you'll have more fun with it! I'm kind of like that too. I like action but get tired of reading it constantly. I'm actually more of a character driven, world building reader. Which make my disappointment in "In the Valley of the Sun" even more mind-blowing. Yep, I'm the same way. In the Valley of the Sun may just be one of those enigmas for you.